Hey! I am the press and I am driving, to where? 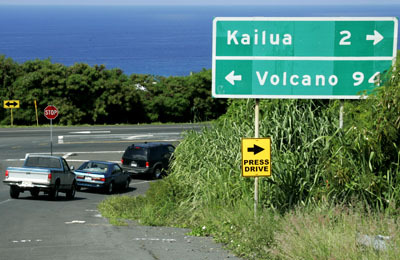 Saw a bunch of these signs on old Mamalahoa Hwy. in Holualoa and they were directing down Hualalai Road to the Queen Kaahumanu Hwy. I don’t know what they were for but they were down by the afternoon. Did I miss some kind of press tour?